CAMDEN COUNTY – The Camden County Courthouse has been threatened by an atheist group over two pictures hanging inside the building. 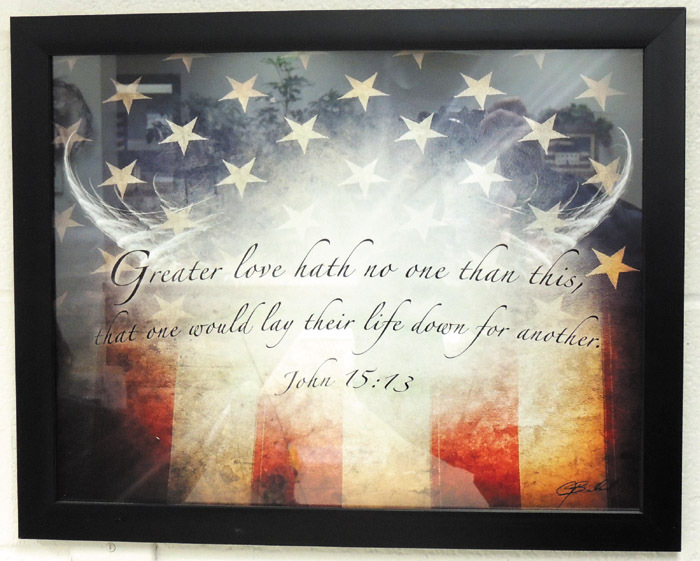 The Freedom From Religion Foundation (FFRF) sent a letter to County Clerk Rowland Todd earlier this month telling him that two pictures “in your office” are a violation of the constitution and have to be removed. The FFRF is an organization that seeks to destroy the belief in any god and eliminate all religious expression, particularly Christianity (see sidebar story). They claim to have a “member of your community” who filed a complaint with the FFRF over the two pictures. They also claim both are in the County Clerk’s office, which is not true. One is and the other is in the courthouse hallway by the elevators and not in the clerk’s office. Todd has no jurisdiction on that painting. Their letter describes the “offensive” items. The words are over stars and stripes. The September 11th Memorial painting is a depiction of the 911 cross that was found in the rubble of the terrorist attacks on the World Trade Center. That cross has been placed on a concrete pedestal and is on display at the actual 911 memorial in New York City. (see sidebar story). 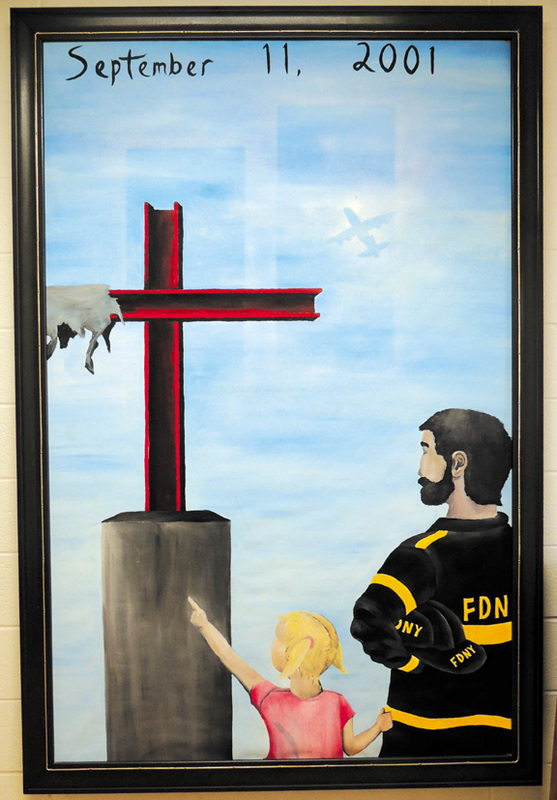 The painting is a New York Firefighter with a small girl who is pointing to the 911 cross. The threatening letter from the FFRF continues with case histories of governments being ordered by judges to remove religious displays. Though the First Amendment only applies to Congress, judges over the years have broadened the law and apply it to any governmental body. Other statements by the atheist group conclude that the two pictures are wrong and there is no argument against their beliefs. The letter concludes with a statement that the clerk’s office cannot do its job if the two are left hanging on the walls. It should be noted again that only one is in the Clerk’s office and Todd has no jurisdiction over the 911 memorial painting in the hallway by the elevators. The FFRF, like the American Civil Liberties Union, have a habit of terrorizing governmental bodies with threats of a lawsuit if they don’t do exactly as they request (order) and the FFRF has no problem suing governments that don’t obey them. The picture in the clerk’s office is actually owned by one of the employees and has been hanging there (with permission) for many years. So the situation boils down to this: does the county remove the two pictures because an organization, allegedly representing a person “from the community”, orders them to do so or do they stand firm and face the possibility of a lawsuit? Todd told The Reporter that he has spoken to Presiding Commissioner Greg Hasty about it but at the present time, Todd said he is not going to do anything with the one picture he has jurisdiction over. The 911 memorial painting, since it is in the hallway and not in Todd’s office, is under the control of the County Commissioners.